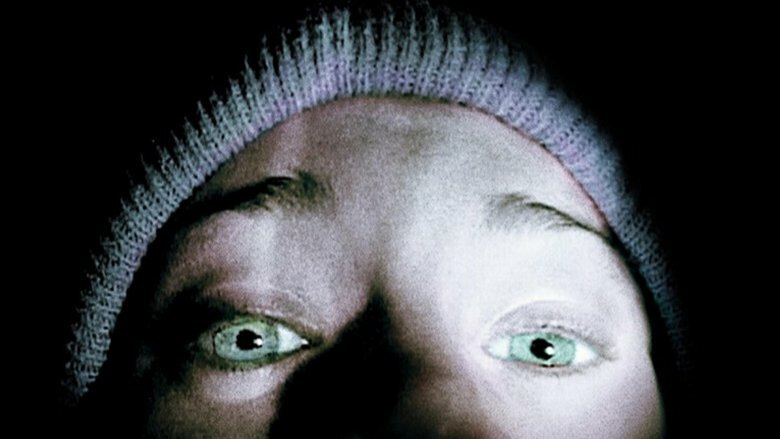 In 1999, The Blair Witch Project premiered in theaters, firmly cementing the found-footage genre as a huge horror moneymaker. The film was made on a shoestring budget of around $22,000 to $35,000 (reports vary), and would end up becoming a worldwide phenomenon, taking in $248 million. Part of the Blair Witch mania that took hold in the years following the film's release was due to its ambiguous ending. What did it mean? Was the tragic fate that befell the three aspiring filmmakers a supernatural one, or was it something more human in origin? When it comes to the the events captured on a Hi-8 camcorder and 16mm black and white film, the truth is as murky as the video quality. We've undertaken careful analysis of the film's unsettling final act, which begins when the camera operator goes missing and ends in the basement of an abandoned house. When taken into consideration with creative team interviews, the extensive mythology that filmmakers Dan Myrick and Eduardo Sanchez constructed on their groundbreaking viral website, and the documentary-style specials produced before and after the film's premiere, the implications of the film's final act become much clearer. This is the Blair Witch Project ending explained. 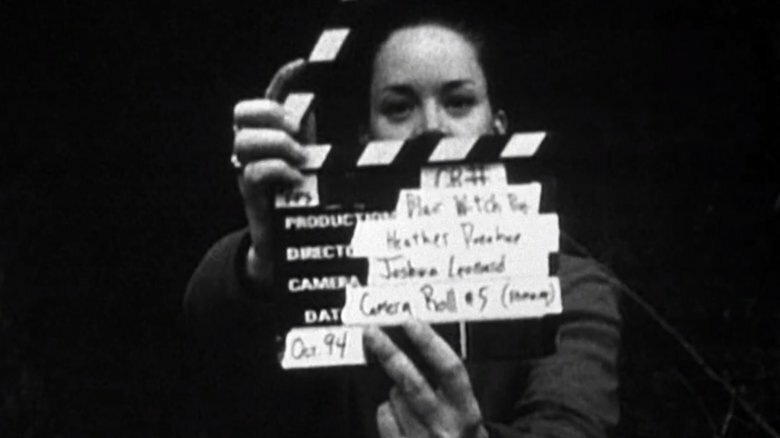 Part of The Blair Witch Project's backstory included the relationships between its fictional filmmakers: director Heather Donohue, sound recorder Michael Williams, and cameraman Joshua Leonard. Josh's backstory included a previous relationship with Heather, and they'd worked together on a few documentaries prior to teaming on Blair Witch. This makes it all the more upsetting for Heather when Josh vanishes from their tent after a particularly depressing day when the group hiked for hours only to end up in the same place. Mike and Heather's first night alone turns even darker when they hear Josh screaming in agony, but can't locate him. In reality, Josh had been taken to a recording studio to perform the screams, which "were played for them in the woods," explained production designer Ben Rock, and were meant to imply "he was being tortured." Heather wakes up to find a strange bundle of sticks outside of her tent. What's inside that bundle? "A swatch of Josh's actual flannel shirt," said Rock, that contained "a lock of his hair" and what was meant to be Josh's teeth, which Rock confirmed were "actual human teeth" producer Gregg Hale got from a dentist. The bundle also ties the torture of Josh to other Blair Witch mythology, which claims that in 1825 ten-year-old Eileen Treacle was seen being pulled into Tappy East Creek near Burkittsville and drowned, her body never recovered. "Thirteen days after the drowning," explains the film's website, "the creek is clogged with oily bundles of sticks." On the second night following Josh's disappearance, Heather and Mike hear him crying out again and decide to try and find him. Suddenly, they come upon a strange house in the woods. 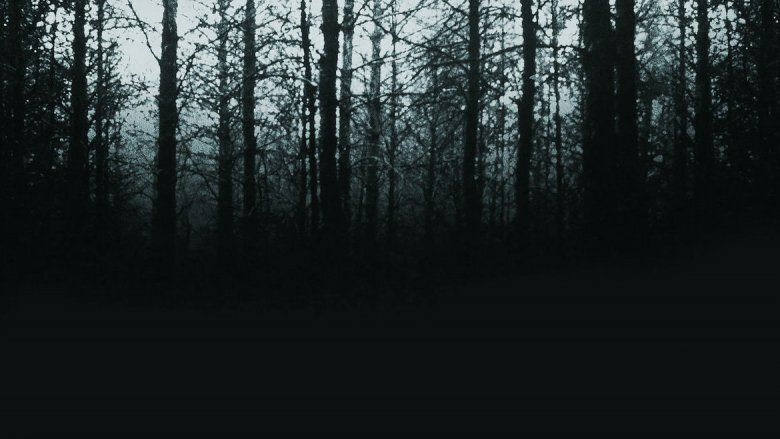 To understand its significance, you have to take a deeper dive into Blair Witch mythology. "Every 40 or 50 years, something really dramatic happened in and around those woods," said Myrick of the lore he and Sanchez created for the film. The timeline of events related to the Blair Witch begins in 1785, when Elly Kedward is accused of witchcraft by a group of children. Kedward is found guilty and banished to the woods to die during a harsh winter. Following this event, more strange events take place in those woods, including the modern case of the "Burkittsville 7." In 1940, seven children are reported missing from Burkittsville, formerly Blair. Their bodies are found buried in the cellar of town resident Rustin Parr. Parr is later executed for his crimes based on the testimony of Kyle Brody, an eighth child who managed to escape. These murders are mentioned early in The Blair Witch Project, when Heather interviews locals about the legend. In describing that part of the shoot, Sanchez confirmed that the house was meant to be Parr's, saying it "was supposedly where all these kids died." In both the Blair Witch "documentaries," which aired on the Sci-Fi Channel and Showtime, Parr confesses to the murders, saying he killed the children because he heard a voice "in his head" that "could've been" the Blair Witch. Mike charges into the Parr house with his camcorder, yelling to Josh and encouraging Heather to follow him. 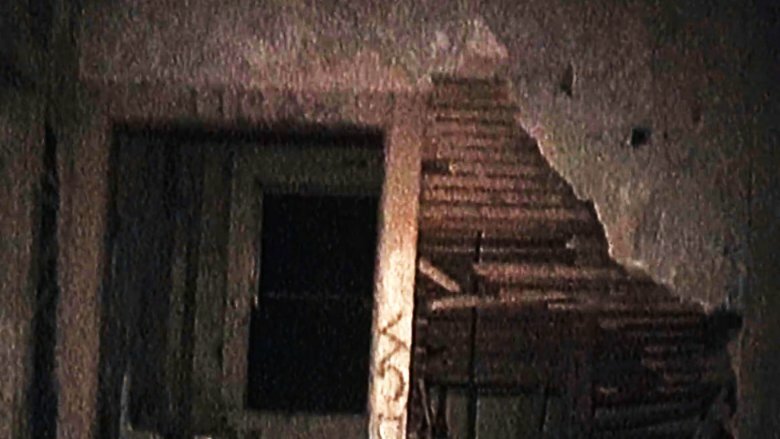 We see Mike and Heather's points of view sweep over the dilapidated house, which only becomes more unsettling as they encounter strange symbols written on the walls. The symbols are from a cipher alphabet known Transitus Fluviia, which dates to a 1510 book of occult philosophy. Rock confirmed that the creative team used this to decorate the Parr house. The letters also pop up in the special The Curse of the Blair Witch, during the tale of Coffin Rock. In Blair Witch mythology, Coffin Rock is the site where a search party sent out after a missing girl in 1886 were brutally murdered. "They had been disemboweled, and on their faces, their hands and feet, were carved these strange pagan symbols," according to Charles Moorehouse, credited as professor of folklore from Maryland State University. They'd been looking for Robin Weaver, who claims she was lured away by a supernatural woman to a house she managed to escape from. Coffin Rock is one of Heather's filming locations. She briefly describes what happened there, and mentions that the faces of the murdered search party were inscribed with "indecipherable writing, cut into their flesh with an eerie precision." The writing is also seen in The Burkittsville 7, written by an adult Kyle Brody while incarcerated at the Maryland State Institute for the Criminally Insane. 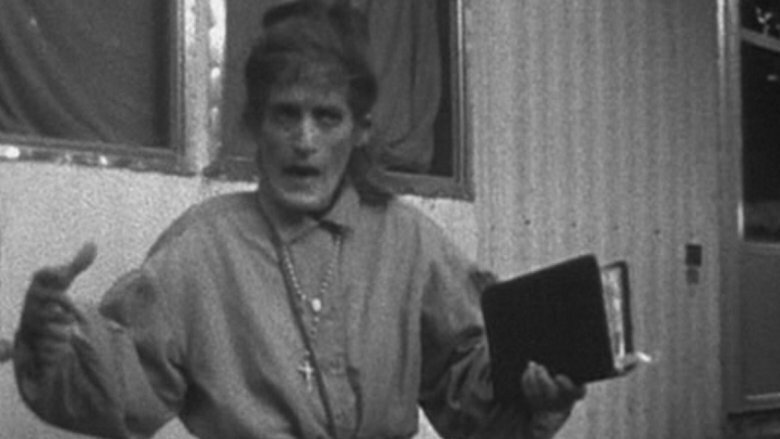 The footage comes from the 1969 "documentary" White Enamel, also fictional, that documents abuses committed at the institute. The strange symbols aren't the only creepy image decorating Parr's house. 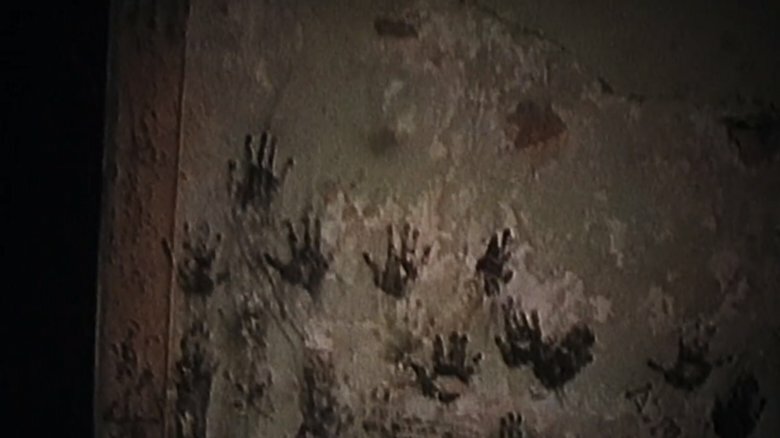 Heather and Mike's cameras reveal dozens of black, child-size hand prints all over the crumbling walls. These were left behind by Parr's victims, who he killed in the basement of the house one by one. Rock said that "Dan had the idea for the kids' hand prints from one time he'd gone to someone's filthy house and their dogs had made a giant black smear at dog-height throughout the house." He remembered Myrick asking, "what kind of residual marks would eight children leave?" 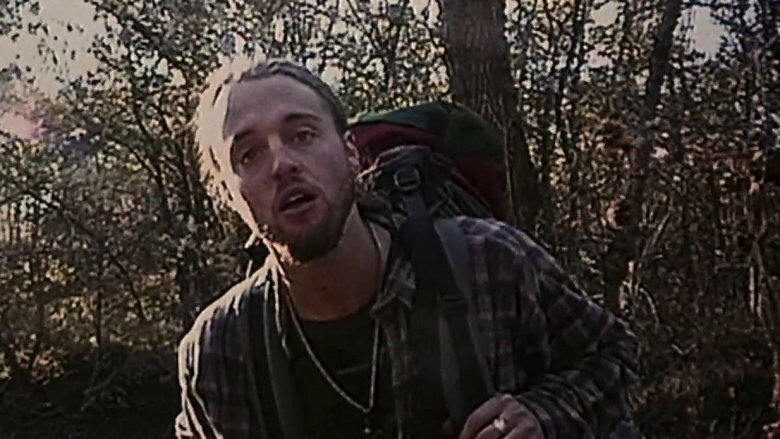 There's only one group of exactly eight children mentioned in the Blair Witch lore: Rustin Parr's seven victims and Kyle Brody, the child who escaped to tell the tale. "Each of them had again been disemboweled," says Lucan Johnson, the fictional host of the 1971 television program Mystic Occurrences, in a clip shown during The Curse of the Blair Witch. "There was again reported strange markings, carvings on their hands." By "again" Johnson is likely comparing the torture of Parr's victims to the mutilation of the search party found dead at Coffin Rock. He does note that there were carvings in their hands, specifically. This might explain the handprints seen by Heather and Mike, as most viewers assumed they were bloody. in reality, they were made using black paint applied to the hands of art director Ricardo Moreno's young nephews. It's the second most memorable moment from The Blair Witch Project (sorry Mike, Heather's up-the-nose camera confession has to win the top spot). After running downstairs, Heather's camera swings around to reveal Mike standing in the corner of the basement with his back to her. Despite her blood-curdling screams, he is unmoved. This final frame of the film left audiences scratching their heads leaving Artisan Entertainment, the company that purchased The Blair Witch Project at the Sundance Film Festival only hours after its debut for $1.1 million, afraid that the ending was too confusing. "When we screened it, people were overwhelmingly confused," Myrick later told Entertainment Weekly. "However, when asked if they were scared, 19 out of 20 hands went up." Originally there was no explanation at all for why Mike remained frozen in the corner. Under pressure from Artisan, during some reshoots in Maryland, the team added interviews in which townspeople talk about Rustin Parr and "how he made the kids stand in the corner while he killed the other kids," said Sanchez. "Mike standing in the corner, being unresponsive, to us, was the most horrifying thing that could happen. Why wouldn't he turn around?" Sanchez wrote the details of the Parr story into The Curse of the Blair Witch. According to Kyle Brody, Parr told the him "to stand in the corner and face the wall. I could hear Emily screaming." Brody testified in court that Parr "was cutting a symbol on her face… after a few days he killed her." So what really happened in the end? There's no definitive answer to this question, and the filmmakers intended it that way. "There's no rhyme or reason to what's happening in those woods," Sanchez has said. "You were never meant to know." So let's investigate the most popular theories surrounding the film's abrupt ending. One theory suggests the filmmakers are actually victims of the Burkittsville townspeople. After two nights in the woods, Heather and Josh discuss the unexplained sounds they've been hearing at night. "Nobody knows we're out here," she tells him. Josh replies: "You ever seen Deliverance?" He's referring to the 1972 film in which a group of men are stalked in the woods by deranged locals. 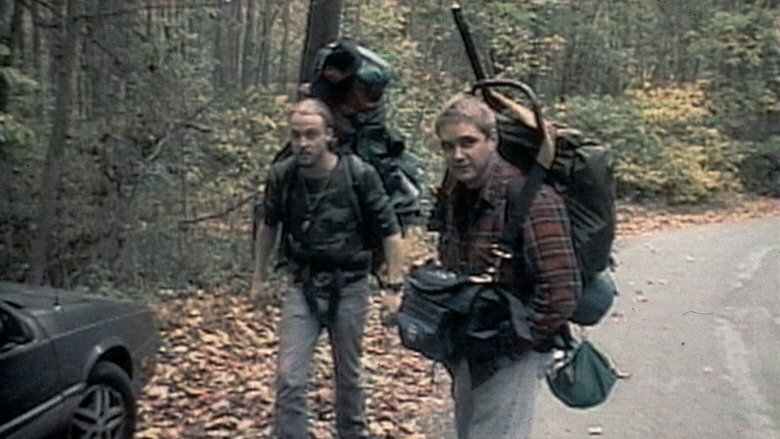 In a deleted scene included on the Blair Witch DVD release, Josh proposes that locals they encountered in town during filming are making a "game" of stalking the team, and that this is the cause of the strange incidents. Fans of this theory suggest Mike is standing in the corner at the film's end because he's being held at gunpoint by an unseen person, while Heather is knocked out and murdered. Others contend that Mary Brown, the strange woman interviewed at the start of the film, is one of these people, as the wooden gate to her mobile home looks similar to both the stick figures and the bundle of Josh's teeth. They also draw attention to Heather referring to a portion of the Bible Brown quoted offscreen, "which warns against crossing a boundary demarcated by stones." A very popular fan theory holds that Josh either lost his mind and murdered Mike and Heather, or that Mike and Josh both conspired to kill Heather together. A fan video makes a detailed case for the idea. The number of people crewing the documentary shoot also seems suspiciously small. Most camera operators use assistants, as refilling a 16mm camera is an involved process, and would be challenging for amateurs shooting in the woods at night, not to mention how heavy all that equipment would be to carry. Did Josh and Mike purposely go into the woods with Heather alone because they had more sinister motives? Heather's diary, recovered under a hundred-year-old cabin by an archaeology class a year after the filmmakers went missing, has some interesting notes on the behavior of her crew. The journal details suspicions that Mike and Josh aren't sleeping. The creative team, when describing how they communicated with the actors to avoid direct contact, explained that one of their notes read: "Josh is slowly losing his mind." There's also the fact that Mike admits to throwing away the team's map in what can only be described as an act of sabotage. A deleted scene reveals that Josh actually crumpled up the map and threw it on the ground before Mike destroyed it, meaning both men were lying to Heather about not knowing its whereabouts. While the real problem with this theory is a lack of motive, as well as the total disappearance of Mike and Josh, it's not surprising some audience members found it plausible. In The Curse of the Blair Witch, it's explained that Rustin Parr's house was burned by townspeople following his arrest. So how were Mike and Heather able to run around a house that had been burned to the ground in the 1940s? How is it that the filmmakers walk south from a river for hours, only to end up in the same place? "I had the compass out all day," Heather's journal reads. "All 3 of us checked it every 5 minutes. We were going SOUTH all day." There's also the strange fact that the filmmakers' equipment and footage was found in the colonial-era foundations of a burned-down house. David Mercer, the archaeology professor who led his class to the site, explains that "even a forensic expert" could not have placed those items without leaving signs of disturbance. So how did it get there? The time warp theory contends that Heather, Mike and Josh hiked into an area of the woods where time is altered. This causes them to hike in circles, leading them to a time when Parr's house is still standing, and it was Parr who killed Heather there while ordering Mike to stand in the corner. It's an idea that connects to events in 2016's Blair Witch film, which wasn't made by the original filmmakers, but it's actually a concept long-supported by Blair Witch canon. 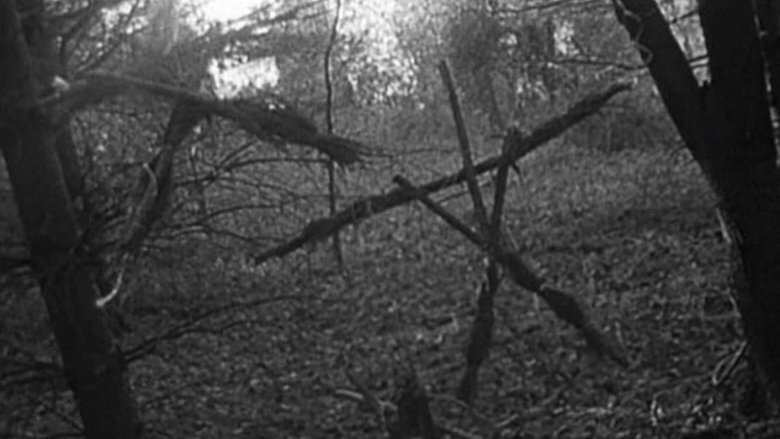 In fact, time warps were part of the Blair Witch lore before the film had even been shot. In the original pitch video for the movie, shown on John Pierson's show Split Screen in 1997, narration explains how "sections of the Black Hills area are lost in time" and "once entered, there is no way out." Of all the endings suggested by fans over the years, the interpretation with the most empirical evidence is that the Blair Witch, or a spirit associated with her, possessed the filmmakers. This force led them astray and turned them against each other, or used unseen figures to dispose of them. Producer Gregg Hale explains: "[Kedward] actually wasn't a witch, but she did a couple of things that kind of made people suspect her." He told ScreenRant that Kedward was blamed for witchcraft, and after being banished to the woods "she kind of became the conduit for this thing," as did "Rustin Parr in the '40s." Sanchez often refers to this power as "the entity," which possibly predates human history: "But the responsibility for triggering the evil," he notes, "falls on human shoulders eventually." 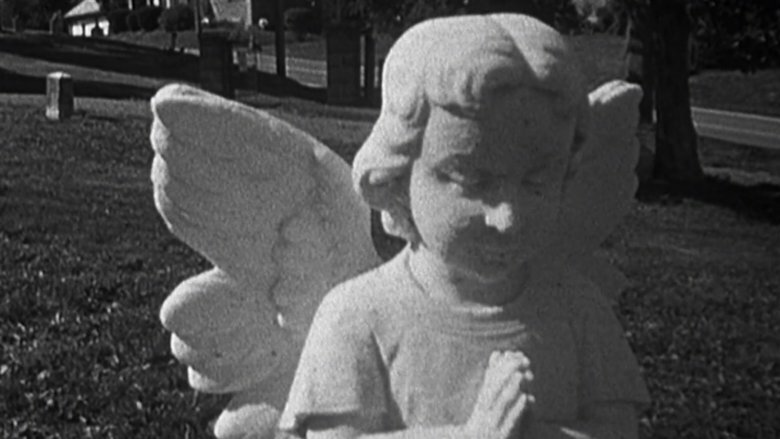 In addition to the creative team's support of this theory, the film itself appears to depict supernatural events. Mike is screaming loudly as he runs through Parr's house in the final minutes of the film, when suddenly his voice cuts off. If Mike was confronted by a time-traveling Parr, or Josh, or creative rednecks, you'd expect to hear him register some surprise, which the mic on his camcorder would have picked up. He's conscious while facing the corner. "I do know that Mike was under some kind of influence," Sanchez confirms. That leaves us with the knowledge that whatever, or whoever, lured Mike and Heather into the house was capable of controlling Mike wordlessly, and of silencing him. Hale implied that the entity doesn't only use Kedward to carry out its evil deeds. "It just looks for a way to affect people and do things," he said. Any one of the previous theories could be correct, when you consider that the "entity" had the power of possession. "Much debate had gone into the ending of the film throughout the process, and the final compromise concept was that the children Rustin Parr had killed would have done this, so after Heather's camera went down, those of us outside the house were to run in and gingerly run around as if we were children who'd been freed… and when we did, Heather made that final scream you hear in the movie, that guttural manifestation, and we all ran into the middle of the house and ran around on the wood floor like idiots." We should have known it was the creepy spirit children all along. Their handprints are all over those walls, waving to us. Don't like that conclusion? How about checking out a few other endings? Several years ago, Sanchez and Myrick confirmed that when Artisan pressured them to change the film's ending to make it more definitive, they ended up shooting four alternate versions that were never used. The budget for the new endings was around $80,000, nearly triple the film's original budget. During the original shoot, Rock explained that Mike Williams "had thrown his torn bluejeans into the woods by the house," and when he and the crew returned to film the new endings, "they were still there. He dusted them off and put them back on for the re-shoots." These alternate endings, which are very unsubtle, range from seeing Mike surrounded by stickmen figures to him being hung or crucified. They're pretty universally reviled, so it's a good thing Artisan decided to trust the instincts of their filmmakers. "What makes us fearful is something that's out of the ordinary, unexplained," Myrick said. "The first ending kept the audience off balance; it challenged our real-world conventions, and that's what really made it scary."